DNS Bank Recruitment 2018: The Dombivli Nagari Sahakari Bank Limited is a multi-state scheduled bank. 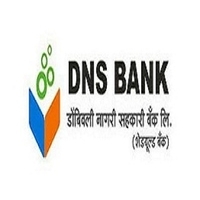 DNS Bank has released a recruitment notification for the post of Assistant Manager Vacancies. The DNS Bank Recruitment 2018 notification was released for a total of 52 vacancies. Moreover, the selected candidates for DNS Bank Recruitment 2018 will be placed at various locations in Maharashtra. The selection of the candidates for DNS Bank Jobs 2018 will be made through the online examination followed by an interview. Petitioners who meet all the prerequisites set by the Dombivli Nagari Sahakari Bank Limited can apply until 13th September 2018. To know more stick to Freshersnow page. The Age Relaxation is allowed up to 5 years for SC, ST, OBC, BC and NT candidates. Candidates should have Degree (Graduation) in Arts/ Science/ Commerce/ Agriculture/ Management from a recognized University. Moreover, people should note that candidates with Degree (Graduation) in the faculty of Engineering, Medical, paramedical, Technical graduation or Diploma shall not allow to participate in the DNS Bank Recruitment 2018 process. And for Computer Literacy – Operating and working knowledge in computer systems is mandatory that is a candidate should have Certificate in Diploma in computer operations or Language or should have studied Computer / Information Technology as one of the subjects in the High School/ College/ Institute. Candidates have to pay INR 600 including GST as application fee. However, candidates belonging to SC, ST, OBC, BC, NT category have to pay INR 500 only. The selected candidates for Dombivli Nagari Sahakari Bank Recruitment 2018 will get a pay scale of Rs.60,000 – 1,80,000/- and Assistant Manager will get Rs.24, 500/-. Marksheets & certificates for Graduation or equivalent qualification etc. Caste Certificate issued by competent authority in the prescribed format as stipulated by Government of India in case of SC / ST / OBC/ BC / NT category candidates. Complete the DNS Bank Recruitment 2018 Registration & Click on the Submit button. After login with the DNS Bank Registered Number & Password. Fill all accurate details in the DNS Bank Recruitment 2018 application & upload Photo, Signature. Then submit the DNS Bank Recruitment 2018 Application Form. Take a print out of Online DNS Bank Recruitment 2018 application for future use.